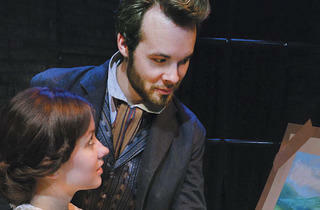 A young art teacher sees double in Robert Kauzlaric’s new adaptation of Wilkie Collins’s 19th-century detective story. Whether or not you’ve read the source material, two aspects of Wilkie Collins’s 1859 detective novel come through loud and clear in Robert Kauzlaric’s new adaptation: the original’s serialized publication and its epistolary format. Characters in Collins’s complex, sensationalized tale of beautiful innocent Laura Fairlie (Maggie Scrantom) and her mysterious white-clad doppelgänger (Scrantom again) are constantly relating new information to one another via post, and there’s a new mini cliff-hanger every other minute or so. 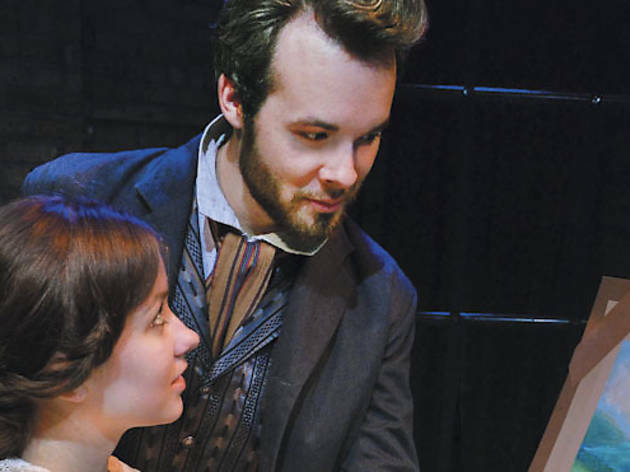 Walter Hartright (Nicholas Bailey), a dashing young artist, is retained to provide drawing lessons to Laura and her doting spinster half-sister Marian (Lucy Carapetyan). Walter finds Laura the spitting image of the raving woman in white with whom he’s just had a rattling encounter; he and Laura fall in love, but she’s promised to one Sir Percival Glyde (Robert Kauzlaric). The connections among Glyde, his menacing associate Count Fosco (Christopher M. Walsh) and Laura and her look-alike, and the necessity of Walter and Marian to come to Laura’s rescue, flesh out the pulpy tale. Elise Kauzlaric’s staging employs clear, creative use of Alan Donahue’s scenic design to delineate multiple settings, and her cast is terrific. Lifeline newcomers Bailey and Scrantom make an appealing pair (or is that trio?) of ingenues, and Carapetyan helps turn a thankless role into an independent-woman prototype. Still, the script remains a bit static, modeled as it is on the letters’ past-tense narration. The second act, following Collins in wrapping up first-act plot points one by one, feels overlong until a rousing climax.